Spring is here and the nature is waking up. Nice days are calling us to spend time outdoors. Maybe you cannot get a seven-day vacation and come to Krk, but a free weekend in April and May can be enough for a quick battery recharge and time to enjoy nice activities outdoors that the island of Krk has to offer. This gastro-cycling adventure will take a place during two weekends, one in April and one in May 2019. During the weekend 12th April till 14th April 2019, cyclist will be able to discover the northern part of island Krk on the trail route Njivice – Čižići – Malinska, with more than 75 km run. On their route, they will taste the best gastronomic offer of this part of island, with organized Bike gastro plate. Second Bike weekend will be organized 17th May till 19th May and will include the southern route of island Krk, Baška – Punat – City of Krk with more than 88 cycling kilometres in 3 days. 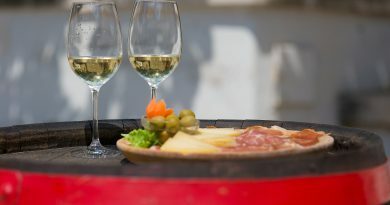 A famous event Crna ovca, local restaurants and local producers of wine, olive oil and sheep’s cheese will organize the Bike gastro plate. Every Saturday at 10am, starting 20th of April till 25th of May, you can join guided educational walking tour among Malinska-Dubašnica’s pedestrian pads and trekking routes. 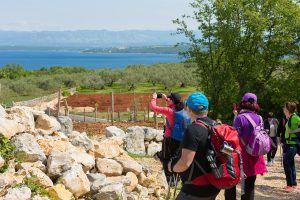 All lovers of nordic walking and hiking will enjoy themed walks and find out more about cultural and natural sights of Dubašnica. Nordic walking is a recreational activity suitable for people of all ages. Unlike normal walking, it activates the upper extremities, because it requiers special rods to carry out activities. The basic principles of nordic walking are the technique of walking, holding the body and using rods. After we master the basics, the Nordic walking becomes a fun activity. This is an outdoor event organized with Malinska Tourist board and Kvarner trails in weekend 30th till 31st March 2019. Narrow trails right to the sea, small coves and hidden beaches, countless off roads, lush vegetation and Mediterannean climate, centuries- old oaks and olives, combined with unmatched climb and lenght, are the perfect combination for a very good trail weekend. This recreational and educational camp is organized from 17th till 19th May in Baška by Tourist Board Baška , event Crna Ovca and Outdoor.hr with Treking Liga. The participants will take a part of a 3 days program with trekking basics in 3 levels to be held on several unique locations of the island of Krk in Baška surroundings. For all participants the camp is free, provided to be online logged until 15th May. Come to Krk not only to enjoy the Sun and the sea, but to feel great after doing some activities outdoors. With us you can reserve your accommodation during your stay. During the weekend of April 14th – April 15th, 2018 in Malinska, Njivice, and Omišalj, an event called “Krk in Motion” is organized for all cyclists, runners, walkers, and hikers, both amateurs and active athletes. 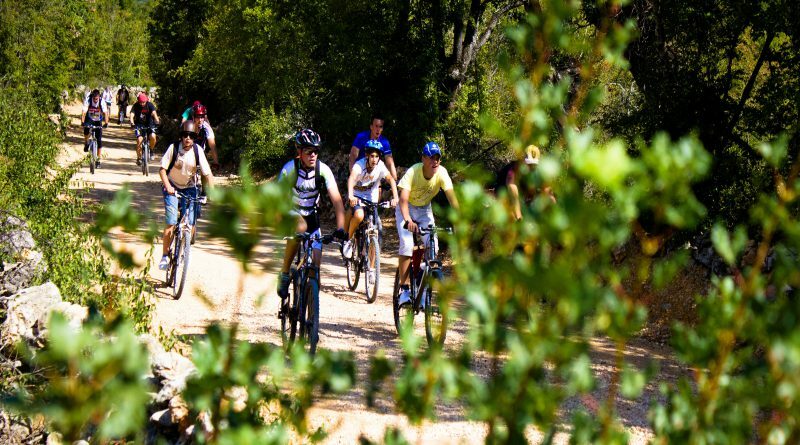 This event includes few disciplines: an orienteering bicycle race, a guided walking tour, an orienteering trekking tour, and a guided amateur cycling event. It is up to you to decide in which activity you would like to participate. Here you can read more about this event. On April 21st, 2018 a race called “Adria Spring Trail” starts in Njivice. It is divided into three categories: Challenger, 26km /600D+, Active, 15km / 450MD+, Light: 6.5km / 250 MD+. Here you can check out all the additional information and the sign-up. Already on April 22nd, you can participate in the event which organizes the mountaineering club Obzova. The starting position is in the bay of Voz, organized in two groups divided according to the difficulties of the path, and it ends in the bay of Sepen on the other side of the island of Krk. The visit ends with a lunch. You can find more information here. May 1st, 2018, a cyclist event for the Labour Day “Đir po Puntu”, more here. May 13th, 2018, a cyclist event “Dobrinjski đir” starts in Čižići, with a sports and a family route. The organizer of the race will ensure refreshments and lunch for all the participants. More information here. May 27th, 2018, at 11 a.m. in Malinska will start a traditional cyclist event “Đir po Dubašnici”, adjusted to different ages.